In large bowl, mix 1 1/2 cups of the flour, the yeast, sugar and salt; set aside. In 1-quart saucepan, heat water, milk and butter over medium heat, stirring occasionally, to 125�F to 130�F; stir into yeast mixture. Stir in egg. Stir in enough remaining flour to make dough easy to handle. On lightly floured surface, knead dough about 5 minutes or until smooth and springy. Cover and let rest 10 minutes. Lightly grease cookie sheet with shortening or spray with cooking spray. 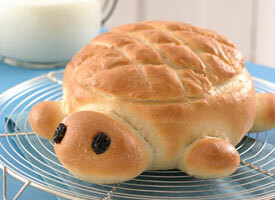 Shape a 2-inch piece of dough into a ball for turtle�s head. Shape 4 walnut-size pieces of dough into balls for feet. Shape 1 walnut-size piece of dough into tail. Shape remaining dough into ball for turtle body; place on cookie sheet and flatten slightly. Attach head, feet and tail by placing 1 end of each under edge of body to secure. Press raisins into head for eyes. Cover and let rise in warm place 20 minutes. Heat oven to 400�F. Make 1/4-inch-deep circular cut around top edge of body, then make crisscross cuts in center to look like a turtle's shell. Bake 20 to 25 minutes or until golden brown.